Naga Earth was established in 2008 in Siem Reap, Cambodia. Their mission is to protect the environment and to improve public health. Naga Earth makes efficient biodiesel and wonderful soap from used cooking oil. We donate our used cooking oil to Naga Earth, and we buy it back as biodiesel for our own generator. We use their wonderful foaming hand soap in our kitchen and bar, for our staff, and in our guest toilet downstairs. Eventually you will find this Eco-friendly soap in every room of our guesthouse and for refill in Babel Eco-shop and Refill Station. They also run hygiene programs for children in the countryside and offer them free hand soap. 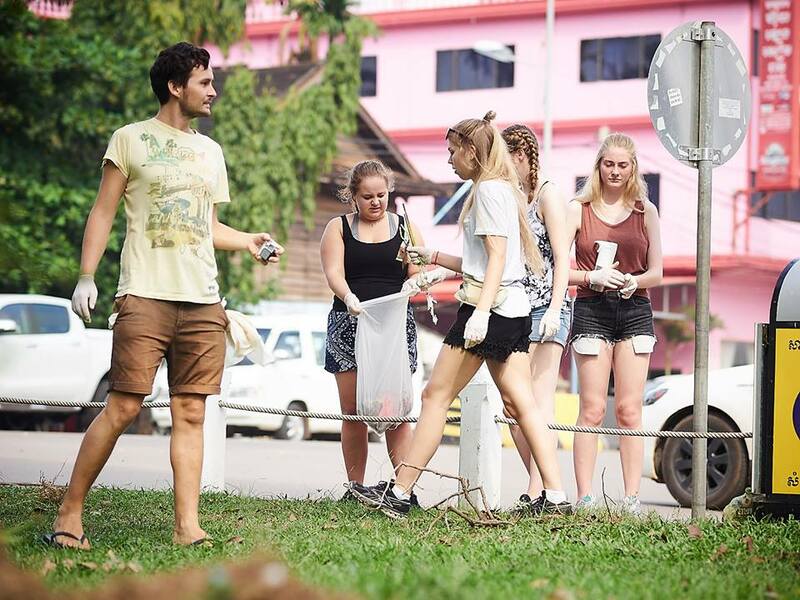 Naga Earth also has different recycling projects, and they offer free recycling workshops to create awareness and spread knowledge to as many as possible. Staff and Tuk Tuk drivers from Babel have done their recycling workshops several times and learned how to make our own business cards with recycled paper. In April 2017 we helped Naga Earth raise money for Cambodia’s first recycling machine for hard plastic through our fund. We sold raffle tickets and held several different garbage picking events, both in Cambodia and in Norway. These events were held in cooperation with Solborg Folkehøgskole, a Norwegian school that brings their students on school trips to Babel every year. We held another big event to raise money for Naga Earth, in conjunction with the opening of Babel Eco-shop and Refill Station in November 2018. This time around, the program was to provide free soap in refillable aluminum soap bottles for children in the countryside.